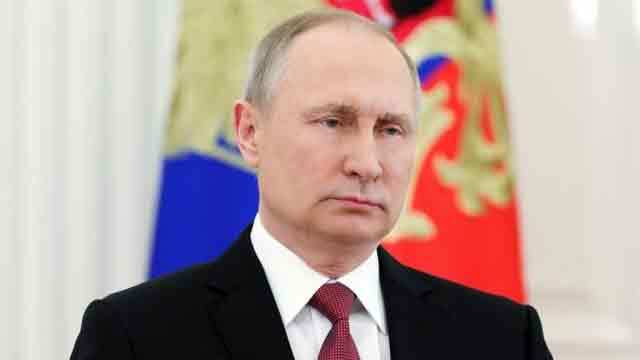 Moscow, May 7 (Just News): Vladimir Putin has been sworn in for a fourth term as Russian president and pledged to harness the country's talents to "achieve breakthroughs". Some 5,000 guests attended the lavish ceremony in an ornate Kremlin hall. He has been in power for 18 years, as president and prime minister, and opponents have likened his tenure to the reign of a tsar, or emperor. Russian TV showed Mr Putin, 65, leaving his Kremlin office and walking to the ceremony, down long corridors. He then took a short ride in a new, Russian-made limousine, called Cortege, in the Kremlin compound. Previously he and his entourage have used foreign luxury cars. In previous years a bigger motorcade drove the president across Moscow to the ceremony. German ex-Chancellor Gerhard Schroeder, now in charge of a branch of Russian gas giant Gazprom, was in the front row alongside Prime Minister Dmitry Medvedev and Orthodox Church Patriarch Kirill. "We have revived pride in our fatherland," Mr Putin said. "As head of state I will do all I can to multiply the strength and prosperity of Russia." "We need breakthroughs in all areas of life. I'm deeply convinced that such a leap forward can only be secured with a free society that accepts all that is new and advanced." He said that in the past Russia had risen again from setbacks, "like a phoenix". On Saturday riot police confronted protesters against his rule in Moscow and other Russian cities. More than 1,000 arrests are said to have been made in 19 cities. The biggest complaint among Russians surveyed by the Levada Centre, a major sociological research body, was that Mr Putin had failed to reduce the wealth gap (the top complaint for 45% of respondents). Another big complaint (for 39%) was the failure to refund Russians who lost savings during market reforms. Mr Putin's most praiseworthy achievement was restoring Russia's world status as a great power (47%), according to the poll. It was conducted last month among 1,600 Russians in 136 towns and cities.